AND I figured out how to attach the doors and what to use for the doorhandles on my shrine piece without spending any money. I used waxed thread to hinge the doors and two beads for the handles. I thought this article interesting, but I don't think people ever stopped appreciating the skills that go into a work of art or craft, do you? Has Conceptual Art Jumped the Shark Tank? "We ought, then, to stop kidding ourselves that painstakingly developed artistic technique is passé, a value left over from our grandparents’ culture. Evidence is all around us. Even when we have lost contact with the social or religious ideas behind the arts of bygone civilizations, we are still able, as with the great bronzes or temples of Greece or ancient China, to respond directly to craftsmanship." Jean at Snap Out of It Jean: There's beading to be done! YEs, eeeeeeeeeek! Jean sent me this MONTHS ago. 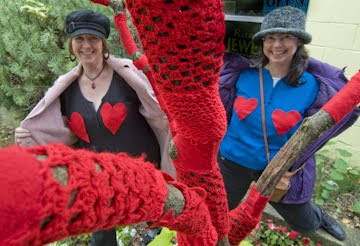 Okay, the jafagirls were goofing around as we yarnbombed the tree outside Art Happens in Kings Yard. Scott stopped laughing long enough to take the photo. I would have preferred knitted boobies but Nancy vetoed that, humph". 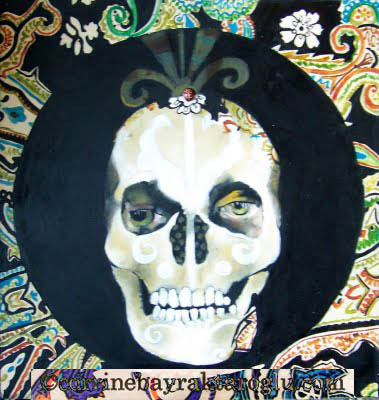 Anyway if you are in the area check out Scott and John's Gallery Art Happens. Yarnbombing: The art of crochet and knit graffiti.